This article on exoplanets and habitability is part of the Science in Sci-fi, Fact in Fantasy blog series. Each week, we tackle one of the scientific or technological concepts pervasive in sci-fi (space travel, genetic engineering, artificial intelligence, etc.) with input from an expert. Today’s expert is physicist Jim Gotaas. In what seemed like a natural progression from an early interest in both science fiction and physics, Jim passed through the gates of a PhD in Physics to a career in research and teaching physics, with occasional stops along the way to enjoy astrophysics and space travel. Unfortunately, the attempt to combine research and teaching with writing SF on the side turned out to be too tough. 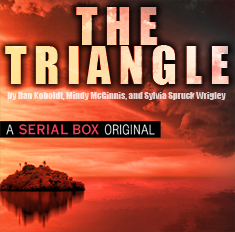 But having now served his time as a professional physicist, he’s happily writing SF as a hobby. 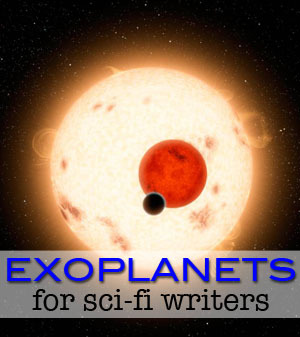 Before we start, ask yourself: as a writer, why do I want to know about exoplanets? 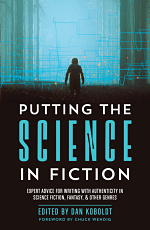 The most compelling answer is that you want to write hard SF, in the spirit of Hal Clement, Poul Anderson, Gregory Benford, or Stephen Baxter, stories that might fit into the pages of Analog SF. Then the discovery of exoplanets gives you new worlds to play with, unlike any in our own solar system. On the other hand, if you’re more interested in space opera, then knowing about these new planets just gives you the chance to build more modern, exotic background worlds for your stories. They may even trigger ideas for different types of stories. On the third hand (shh, I’m an alien!) you may just enjoy knowing about developments in the sciences, so you can make better sense of what you read. So on to our Goldilocks exoplanets! If you’re not familiar with the idea of the Goldilocks zone, or more scientifically, the habitability zone, it’s the range of distances from any star which will allow liquid water to exist on an ‘ordinary’ planet, similar to Earth. This is only a rough concept, built around the idea that life as we know it requires liquid water at some point in its existence, and that it’s best if that water is on a planet. Given the type of star, we can calculate how much energy a planet will receive, and what its average temperature will be, all else being equal. Aside from the Goldilocks zone, we’re now fairly certain that there is liquid water under the surface of Europa, one of Jupiter’s Galilean moons. Here the energy to support liquid water doesn’t come from the Sun, but from tidal heating. We have no way of knowing if life can arise under those circumstances, because we really don’t know exactly how our sort of life arose, and precisely what conditions it needs. And, of course, there is also the remote possibility that life can arise and exist without liquid water, but that’s far outside our current understanding of life, so it pretty much remains in the realms of science fiction, not science fact. We’re now starting to get a glimpse of what kind of planets orbit other stars. There are currently more than 3400 definite exoplanets and almost 5000 candidates still to be confirmed (as of February 2017 – but this is constantly changing), of varying sizes and orbits around various other stars. And guess what? It turns out that our old familiar solar system, with rocky planets close to the sun (Mercury, Venus, Earth and Mars) and gas giants (Jupiter and Saturn) and ice giants (Uranus and Neptune) further out, isn’t the typical example we previously thought. Instead, we have hot Jupiters, hot Saturns (also known as puffy planets, because their density is so low that they would float in water – if you had a big enough bathtub! ), hot Neptunes, Super Earths, water worlds, and even Chthonian planets (chthonian derives from Greek mythology and refers to beings that inhabit the underworld, the Greek version of Hell), and models of solar systems that involve radical rearrangements of planet locations during the evolution of the planetary systems. 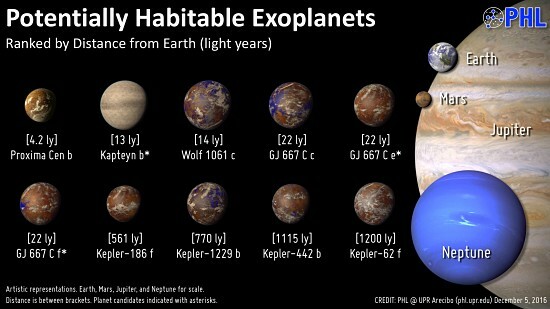 In discussing these types of exoplanets, you should keep in mind that these names are not precise, but just evocative titles in terms of planets we know. You should also be aware that the current techniques for finding exoplanets tend to favor massive planets that are close to their star, so the catalog of exoplanets is biased toward these types. It would take too long to discuss the ways in which these exoplanets have been detected, but if you’re interested, check out Exoplanet Detection Methods Visualized at PHL. It’s worth remarking that some of the newly discovered exoplanets are not new to science fiction. These include some super Earths (rocky planets that are larger and more massive than Earth) and water worlds (planets that are completely covered by oceans). The excitement here is that there’s now a scientific basis for stories about these worlds. But for our purposes, we’re going to concentrate on the exoplanets that are really new and different from our own solar system and traditional SF. So what are these new planets like? Planets are usually characterized in terms of their mass (often expressed as multiples of the mass of Earth), their radius, and the elements they’re composed of. Beyond that, in understanding their physical state, the radius of their orbits (often expressed in terms of astronomical units AU, which is the average radius of the Earth’s orbit about the Sun) and the type of star they orbit are important. The last two basically determine the star’s habitability zone. Whether or not a planet in that zone can be considered Earth-like depends on the first three. As illustrated in a lovely infographic at Space.com, there is a huge range of types of exoplanets. We’re going to look more closely at just a few of them that are most unusual and were unexpected. These are like Papa Bear’s porridge: just too hot. These are planets roughly the size of Jupiter, but they’ve ended up in a close orbit around their star (typically from 0.015 to 0.15 AU – by comparison, Mercury’s orbit is at 0.39 AU). This means they’re very hot, and this will affect the composition of their atmospheres, but if they’re massive enough, they remain gas giants. (If they’re not that massive, they can become chthonian worlds.) Because they orbit so close to the star, they are tidally locked, meaning that they always show the same face to the star (just as our Moon is tidally locked to Earth, always showing us the same face). One example discovered in 2005 is HD189733b, which is about 63 light years away from us. With a mass about 13% larger than Jupiter’s, this blue planet orbits the star every 2.2 days and has an orbital radius of about 0.03 AU. It has a dayside temperature of 1,700 ºF (927 ºC) and a nightside temperature of 1,200 ºF (649 ºC). Our current theories about the origin of stellar planetary systems require that gas giants actually form out where the hydrogen can easily condense into a planet (such as Jupiter or Saturn). Then at some point, they migrate into a close orbit about the star and heat up dramatically. During this migration, it’s likely that often smaller planets (such as any that are Earth-size) will be flung around the system in its wake. More Papa Bear exoplanets here! Hot Neptunes are similar in mass to Uranus or Neptune, but orbit much closer to their star, normally less than 1 AU (compared to about 20 AU or 30 AU). An example orbits the star Gliese 436 every 2.64 days, and sports a sort of comet tail as it moves, the result of hydrogen in its atmosphere boiling off into space. If a hot Neptune loses all its atmosphere, it can end up being a rocky planet similar in size to Earth. And yet more Papa Bears: Chthonian planets are to some extent hypothetical. They are basically supermassive rocky or metallic worlds, although we think they have evolved from hot Jupiters whose atmospheres have been boiled off by the radiation from the star, leaving behind a solid remnant core. One suspected example is CoRoT-7b, located 480 light years away. This planet orbits at about 0.02 AU, is 70% larger than Earth, and is almost 5 times as massive. With a dayside surface temperature of about 3600 ºF or 2000 ºC, if it has any atmosphere at all, it will be a tenuous one of vaporized rock. Welcome to the Baby Bear’s bowl of porridge: these are the planets that may lie in the Goldilocks zone, being ‘just right’. The key word here is potentially, since our detection methods so far can’t provide much detail about the masses or atmospheres of these worlds. Shown below are some likely candidates, with their astronomical designations and distances from Earth. They are displayed here from closest (4.2 light years) to farthest from Earth (1200 light years). Since we don’t actually have direct images of any of these exoplanets, shown above are artistic renderings of those that seem most likely to have liquid water on their surface. They are all larger than Earth, but we have no estimates of their masses and we’re not certain about their composition and habitability yet. So we only know that they’re roughly the right size and in the Goldilocks zone for their stars. These are subject to change as new interpretations or astronomical observations are made. For comparison, our local planets of Earth, Mars, Jupiter, and Neptune are shown in scale on the right. The detection of atmospheres on exoplanets is quiet difficult, as it requires being able to see the effects against the backdrop of the star’s intense light. So far, all such examples are of hot Jupiters or hot Neptunes (recall Gliese 436 mentioned above), and a variety of gases has been detected, including hydrogen, helium, carbon, oxygen, sodium, water vapour, carbon monoxide and methane. Hey – what about Mama Bear’s exoplanets? Up until now, our methods of detecting exoplanets aren’t precise enough to present detailed descriptions of many planets that are outside the habitability zone, which would make them too cold. However, several hundred have been found, and astronomers have actually directly imaged four massive planets orbiting HR 8799, a young system (only 30 million years old, compared to the Sun’s age of 4.5 billion years) located 129 light years from us. The data are a bit rough, but these planets have estimated masses about 5-7 times that of Jupiter and are at distances ranging from 14.5-68 AU. If one thing is certain, it’s that the list of confirmed exoplanets will continue to grow, and new telescopes will provide us with more information about their physical characteristics, including their atmospheres. In a few years’ time, we may be able to describe many more of these planets much more completely. For exoplanets, these are exciting times! For the most up-to-date information about exoplanets, visit the NASA Exoplanet Archive. For more information and some slightly out-of-date but interesting graphics, take a look at The Planetary Habitability Laboratory.